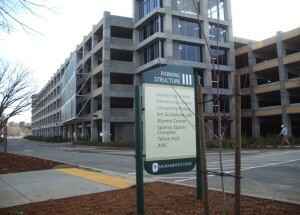 Like going to Cal Expo, visitors to Sacramento State will have to pay to park when attending the Grant vs. Folsom game. Parking fees cost $6.00 for the full day per vehicle or $3.00 for 2 hours. Hypothetically, a game is supposed to run only two hours; however, it may be wise to pay for the full day pass so you don’t have to run out to car with five minutes left in the game (especially if it’s down-to-the-wire). Visitors to the campus may purchase a permit machine located in the campus parking lots, the parking structures, and at information booths located near campus entrances. View the campus parking map for more details about parking locations. Game kicks off at 7:30pm this Friday. December 2, 2010 in Pacers.